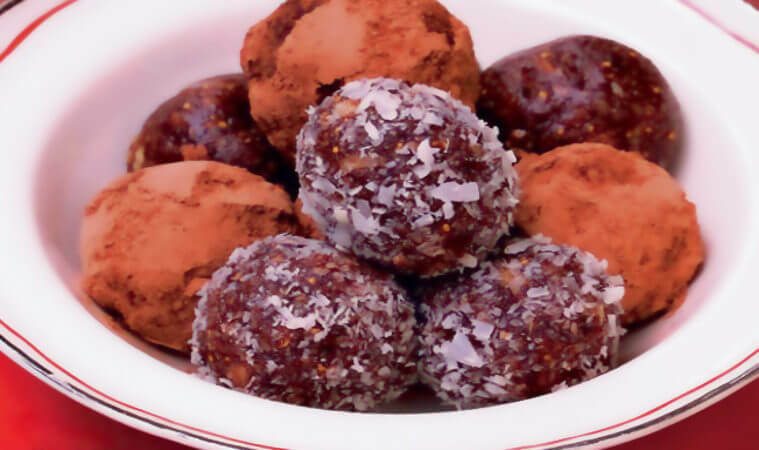 Raw cacao truffles are dead easy and quick to make. And it helps that they happen to be extemely delicious, and full of great nutrition too. This recipe uses the classic combination of dates and walnuts with cacao. But it’s that little hit of mandarin that really makes them great. It will only take you about 10 minutes to make them and you can be eating the first one as soon as they are rolled into shape! Start to blitz the walnuts and dates in a food processor (a stick blender can work fine too). Add all of the rest of the ingredients (except the coconut), and continue to blitz until it all mixes nicely and comes together. You might need to scrape the walls of the food processor a couple of times to get there. If it’s too dry and not coming together add a few more dates (or a few drops of water). Roll into balls using your hands – it’s a bit messy but by far the easiest way. Then roll into the shredded coconut and/or cacao powder to finish. You should get about 10 truffles – unless you’re being a bit overgenerous and making them really big! That’s it – dead easy. When recipes are this quick and easy to make there’s no excuse for eating junk processed snacks. Just make sure you always have the basic ingredients handy in your store cupboard. It’s much cheaper to buy ingredients like cacao in larger bags anyway.